Over the past few years, Millions of users across different countries have been added to the net surfers list. This creates a demand of multilingual websites which appeal more to native speakers of the language. Before ASP.NET, developing multilingual applications in HTML was a daunting task. Programmers were required to develop multiple pages for supporting multiple languages. Though, PHP and ASP was introduced, there was not much relief for programmers in terms of saving their time. ASP.NET together with Visual Studio makes life easier for a programmer. Being enriched with namespaces such as System.Globalization and System.Resources.ResourceManager and in the presence of CultureInfo class, a programmer feels at ease for going beyond the scope of a particular language. First, I would explain how localization process is carried in .NET. Resource files are XML (Extensible Markup Language) files. For different languages, you have to make different resource files. At compilation time, these files do get embedded in assemblies. The file which you have specified as default (which would represent the default language of your application) is embedded in the main assembly. Based on the CuurentCulture value, an appropriate error message in the user language would be displayed. * All the language contents are placed into XML files and there is one file representing that language. * By making use of CultureInfo class and CurrentCulture variable, the Resource manager localizes a page by producing run time version of the generalized page. If you have to support n languages, you have to develop n resource files. The naming convention is: The first part of the file name is base name. The second part specifies the culture. This is optional part. If you skip it, the resources in the resource file would be defined for default values. Example: Your page name is webapp.aspx and you have to include three additional resource files. To include US English, Egyptian Arabic and Israel Hebrew, You have to name these resource files as webapp.aspx.en-US.resx, webapp.aspx.ar-EG.resx, webapp.aspx.he-IL.resx respectively. If you skip the second part of the name, you would be assigned resources on default. For localizing a page, design a sample page whose controls are to be localized. By sample page, I mean a page whose controls are assigned different language specific values based on the CurrentCulture value of the Current thread, as we have shortly discussed. After designing the page, go to Tools and then select Generate Local Resource. LabelResource1.Text = "?? ?? ????" Here are snapshots of two resource files. The first one contain localizable controls which have been translated in urdu language resource file. The meta:resourceKey is Localization expression and its value (LabelResource1 in this case) points to the base resource. Similarly, to add other resource files for different languages, just copy all the items from the main resource file and translate the values in the respective resource files. Field Validators are often required to validate controls. It is better to use validators rather than authenticators in some controls. Regular expression Validator is a powerful control which lets you restrict the user to a specific pattern of input. Sometimes, localizing these Validators become an important requirement for your application to work properly. For example, the style of writing the date is different in English and Arabic scriptures. If you want to enquire an employee for writing the date at which he joined his firm, the employee belonging to US would write something like 02/06/2003 and an employee in Arab would like to write it as 2/6/2003 . Now, your job is to validate both these fields based on their culture. There are two approaches to localize Regular expression validators. The first one is Explicit Localization expression in which you write something like. Where ReusableResources.resx is the resource file containing definition for the AcÃ¢â€šÂ¬~DateFormat'. Where TextDirection is defined in ReusableResources.resx. * Localization support is better in ASP.NET as compared to previous technologies. * One Generalized web form is enough to accommodate as many languages provided you put resource files for all the languages. The CultureInfo class object has to be changed appropriately. * The resource files should be named using standard conventions and the values of controls should be translated after copying them from main resource file. * The validating fields can be localized by explicit localization expressions which require the programmer to translate the stuff and put it at the place where the expression points to. 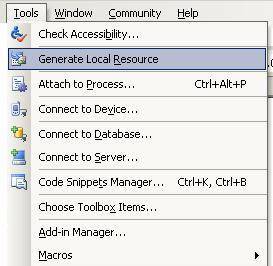 * The expressions can be made reusable by defining a resource file and putting it in app_GlobalResources folder. * Writing style can be changed by putting it in html tag. This is it for now. Try using different combinations and you would experience something powerful.